Those of us who submit to the major coin grading services, NGC and PCGS, are often disappointed because we would like to think our coins are better than they often are. That’s the reason why we have slabbing companies. Collectors (first party) typically think their coins are in better condition than do buyers (second party); so we rely on third-party graders to give us their best objective estimates. In that role they become numismatic referees. Like those in the sports world, their reputations are based on consistency. Yes, coin grading is a subjective exercise–to an extent. Grades from top companies shouldn’t be off by more than a point or two. Every now and then, though, collectors get grades that seem overly subjective, to the extent that they want to do something about it. Both of the top grading services have outlets for that. If you disagree with a grade, you can resubmit the coin and pay the appropriate fees. I usually send the coin to the rival grading service. This way, I get an education for my fees, ascertaining the fine points of slightly different grading practices. Recently I won in a Proxibid auction a 1932-D and a 1932-S Washington Quarter. 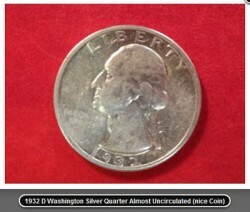 I wanted these in NGC holders as I was considering beginning a set registry of quarter dollars with the company. 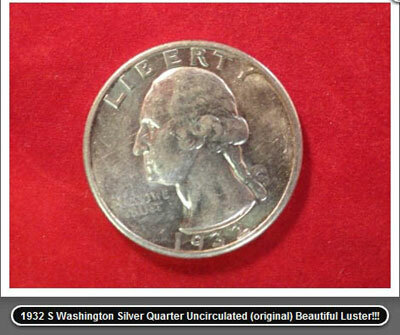 The pictures below show how the Proxibid auctioneer (a coin dealer, by the way) described each coin (“almost uncirculated” for the 32-D and “uncirculated” for the 32-S). NGC graded both of them XF45. Click to expand any of the photos. I was disappointed in the grades, but more so in that both coins received the same designation when the 1932-S was clearly the better coin. While both had luster, and the 32-S had more, the breast feathers of the 32-S were distinct whereas the feathers on the 32-D were fainter and more worn. In making decisions whether to resubmit a coin, I usually rely on PCGS Photograde Online. This is an easy to access free resource with quality pictures. Using it, I believed my 1932-D should have graded AU50-53 and the 1932-S, AU55-AU58. I’m writing this post at on April 6, 2012, the day that PCGS received my crossover submission. 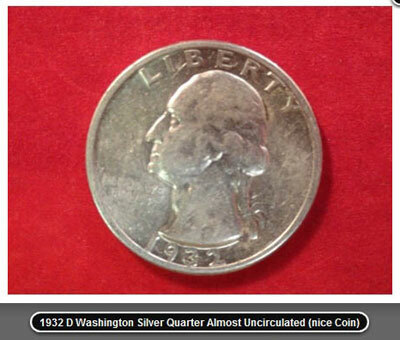 Of course both companies do not know Coin Update will publish this post (but NOT until PCGS reports its grades). By the way, I wrote “ANY” on my PCGS submission form rather than “CROSSOVER” because I wanted to give the graders as much leeway as possible in helping determine who was right–the Proxibid auctioneer (first party), your columnist (second party) or NGC (third party). That makes PCGS the referee. Have you ever sent NGC coins to PCGS (or vice versa) because you were disappointed with a grade? If so, tell us what happened. We’ll tell you what happened with these coins as soon as we receive the PCGS grades. Dr. Mike – This is a great experiment, similar to when you re-slabbed some of your OGH Morgans, and I look forward to seeing the published results. In your experience, do you find that the differences in populations at the respective companies are the result of more stringent requirements at one company versus the other; that the differences could depend upon the type or series of coin each company is grading; or that the results are directly related to the respective number of submissions presented to each of the companies?? In reality, I would guess that some part of all three considerations could impact any particular coin at any time. Like you said, these companies are top-rated because of their consistency. Yet, by coin, there always seems to be substantial deltas in census numbers and distribution, as well as the higher, secondary market demand for Coin X graded by one company vice the other – due in part to the perception of a lower population at higher grades. In a perfect world, a 70 is a 70 is a 70. But, in this subjective world, that’s not always the case. That’s a wonderful comment, and a great question–or questions. I love getting comments like this because they are challenging and tap my experience. I have a distinct opinion about this, as it happens. And the opinion is, it depends on the series and the company. Let me give a few examples. Several years ago, NGC slabbed 1995 Double Die cents in MS68 were selling higher than PCGS, because NGC had graded fewer at MS68. I just checked the census, and NGC has graded roughly twice as many such cents. I just checked CoinFacts for latest auction prices and, as expected, PCGS holdered coins at 68 are selling for about $150 whereas NGC at the same grade is selling for about $25-50 under that. NGC 1 CENT 1995 DOUBLED DIE OBV: MSRD: MS67, 9260; MS68, 6129; MS69, 17. PCGS 1 CENT 1995 DOUBLE DIE OBV: MSRD: MS67, 2808; MS68, 2692; MS69, 1. So census figures do matter, in this respect. 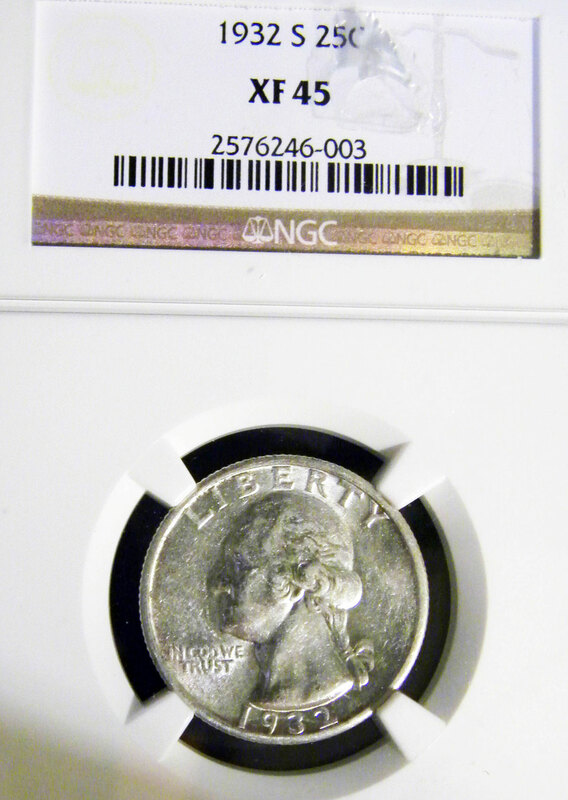 In my experience, NGC gives better grades than PCGS in uncirculated gold coins, all denominations; uncirculated 20th century half dollars, quarters, dimes and nickels. PCGS is also tougher on Morgan dollars, but its grades again demand premiums, so I submit there. NGC is tough on circulated coins. I always send those to PCGS. They grade higher, typically, but also find more “genuine/details” when they do. I used to send silver eagles to NGC, but began sending them to PCGS when the former company stopped considering crossovers. (I collect rainbow toned silver eagles exclusively.) I was surprised to find that PCGS is so consistent in grading silver eagles that I know the grade before I receive the coin. I am never surprised. So you’re right: It depends on census and series. I would also add uncirculated vs. circulated. Dr. Mike – Thanks, so much, for offering your insight. I value your opinion greatly and will definitely keep these thoughts in mind as I move forward in our hobby. Cheers!! As for your request for comments on crossover coins; I submitted a 1901-P Morgan that was graded AU55 by NGC. I submitted it to PCGS for inclusion in my set registry. The coin came back as Genuine/Cleaned, but was not re-slabbled. 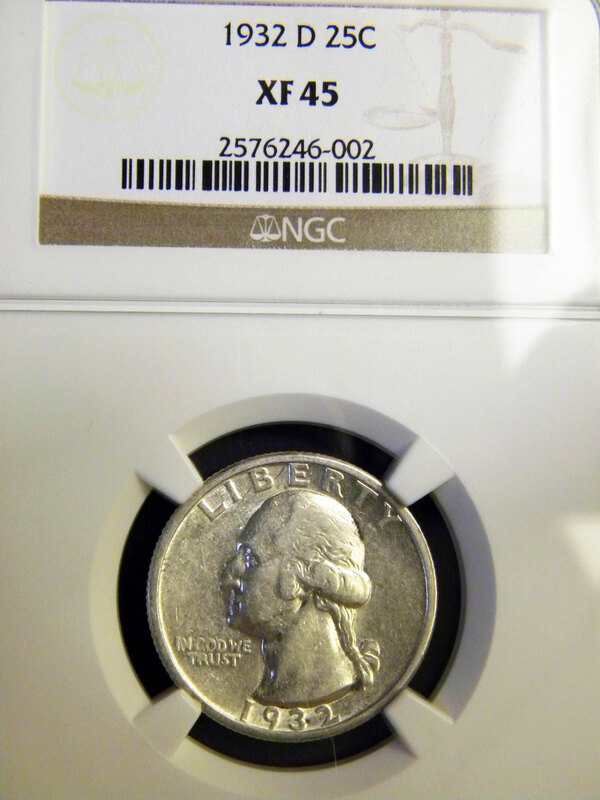 It remained in the NGC holder as AU55. Luckily I held the coin for about 6 months and took it back to the coin dealer where I purchased the coin and sold it for only a $20 loss. I eventually found a 1901-P that was PCGS AU55. I’m looking forward to the result of your PCGS/NGC grading comparison. Thank you, Silver Dollar City Coins, for sharing your crossover story. Sometimes I wonder about “Genuine/Cleaned.” PCGS is stricter, a lot so, on dipping. I would imagine the NGC coin had traces of dipping, resulting in the designation. Thank you for your anecdote about NGC and PCGS. It’s always an interesting discussion to see which is stricter; I’m thinking both are rigorous according to each way of grading. The more one works with one company, the more we believe that company to be the more consistent, probably because we are used to its grading standards. I tend to use each company for different series, but I don’t mix companies on those series.